Christian fiction set during World War Two. In a story of intrigue, bravery, development, and faith, historical fiction author Sarah Sundin once again brings to life a beautiful story of World War Two heroes and heroines. The Sea Before Us, the first novel of Sundin’s “Sunrise at Normandy” series, is a thrilling beginning to a trilogy set around D-Day. My most anticipated novel of 2018, The Sea Before Us exemplifies why Sundin is a favorite of World War Two novel readers–she is a master of blending historical details, strong plots, and authentic emotions into the stories of the brave men and women who fought during the world’s most troubling time. In a series reminiscent of Christopher Nolan’s Dunkirk–depicting a World War Two battle through the lenses of soldiers fighting from the sea, sky, and land–The Sea Before Us opens the series from the perspective of naval officer Lieutenant Wyatt Paxton and WREN Dorothy Fairfax. Series typically are written with stories in chronological order, but the Sunrise at Normandy series stories will be told simultaneously, with each Paxton brother depicting his story from his particular perspective of the battle. I am so excited to read a series written in this order and found Wyatt’s perspective–from the sea–a engaging one that opened D-Day and its preceding and following events in a way that has me eagerly awaiting the next story. With such a captivating tale of the sea battle, I can just imagine how well written the stories from the land and air will be. The Sea Before Us centers upon two characters who struggle with love–familial, romantic, and for and by God. Wyatt Paxton and Dorothy Fairfax’s stories deeply touched me because Sundin’s talent for writing emotionally compelling characters drew this hero and heroine off of the page. While the circumstances surrounding Dorothy and Wyatt’s respective stories were out of my realm of understanding–and therefore kept me from wholly identifying with them–I never once questioned these characters’ feelings. Of the two main characters, Wyatt’s steadiness, loyalty, protectiveness, and determination to do right by his family endeared him to my heart. I never found Dorothy, however, more than passably likable because her character development came across as shallow. She did, though, make strides in this development toward the end of the book, which I was happy to read because her story was so touching. While The Sea Before Us was my most anticipated book of 2018, this novel is not my favorite of Sundin’s for a few reasons. Names of numerous side characters as well as the various titles of the military men and women who crossed paths with Wyatt and Dorothy overtook scenes, and I found myself frequently pulled out of the story as I tried to place ranks with duties, abbreviations, and branches of the military. Wyatt and Dorothy’s romance, while sweet, felt flat in its execution despite how often they were together on the pages. I knew why and how they came together but never truly felt their feelings for each other. I also would have preferred more showing in Sundin’s writing technique rather than the telling that seemed to overtake her prose. Sundin’s passion for World War Two history and her subsequent mastery of transferring that passion and knowledge onto the pages of the story took the moderate pace of The Sea Before Us to an engaging one. This author’s ability to infuse the stories of men and women with the details, dangers, and bravery of this time period is second-to-none. By contrast of the slower pace with which I turned the pages of most of this book, when the D-Day invasion approached, I couldn’t get enough of The Sea Before Us. I was absolutely transfixed by what I saw of the invasion through Wyatt’s eyes. One piece of the scene that involved sailors and soldiers communicating in an unexpected way brought even more admiration and respect for the Greatest Generation that I already had–the mark of a truly talented author. 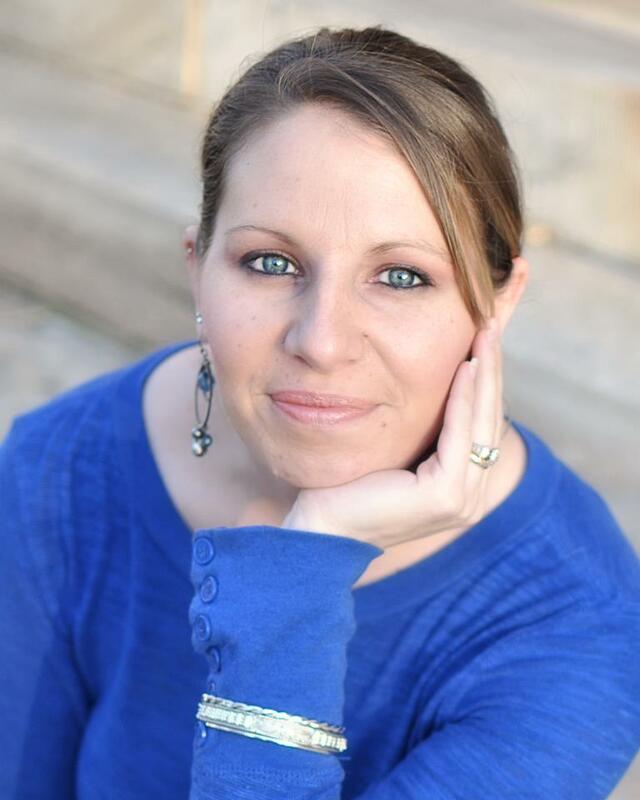 Sarah Sundin is the author of Through Waters Deep, Anchor in the Storm, and When Tides Turn in the Waves of Freedom series, as well as Wings of the Nightingale and the Wings of Glory series. Her novels have received starred reviews from Booklist and Library Journal. 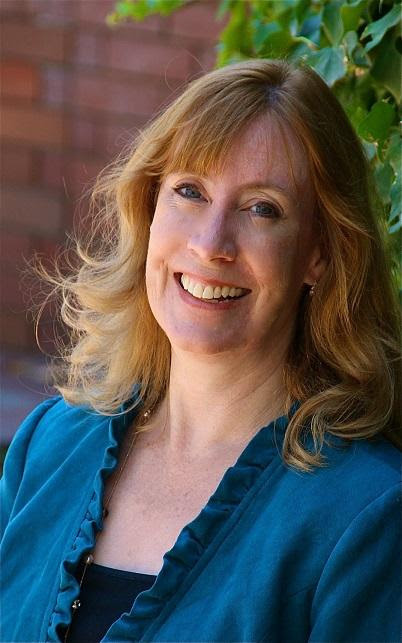 Her popular Through Waters Deep was a Carol Award finalist and named to Booklist‘s “101 Best Romance Novels of the Last 10 Years.” A graduate of UC San Francisco School of Pharmacy, she works on-call as a hospital pharmacist. Sarah lives in California. Visit her website for more information. In 1943, widowed seamstress Heidi Wetzel finds new meaning in life by caring for evacuated childrePhin on a rural farm in war-torn western Germany. Never a supporter of National Socialism, she takes pleasure in passive resistance, but must exercise caution around neighbors who delight in reporting to the Gestapo. When Heidi stumbles into a man she recognizes, she is shocked to realize he is a friend from her high school days in the United States, and the husband of her best friend Rachel. Aiding an enemy downed airman is punishable by execution, but she agrees to help. Teacher, philosopher, and magician Albus Dumbledore, from the world of the Harry Potter series by J.K. Rowling once said, “It takes a great deal of courage to stand up to our enemies. But it takes a great deal more to stand up to up to our friends.” I thought of this quote often while reading Terri Wangard’s novel Friends and Enemies–and not simply because of the similarity of words between the quote and the title. 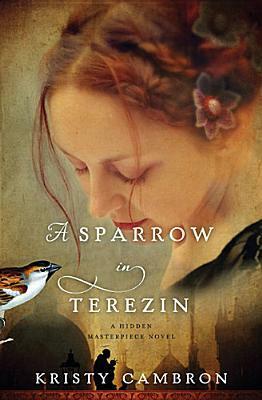 While novels set during World War Two are fairly common amongst both the general and Christian markets, the aspect of Friends and Enemies that marks this as a must-read novel for fans of the genre is its ability to make a person question who was really a friend or enemy in a country condemned for actions taken by only a select few. A novel of Christian romance as well as history, Friends and Enemies brims with details, facts, and research that makes the story come alive. Wangard deftly weaves her plot and characters around true-to-life insight and knowledge of what it was like to live, love, and fight during World War Two. While I found that this novel could be improved through writing and editing, overall the story captivated as I watched the author unfold the intricacies as both a friend and enemy of World War Two Germany. Main characters Heidi and Paul are interesting enough to the story, but Friends and Enemies shines because of its plot. Paul–daring, brave, and questioning God–is an appealing hero. As a flight navigator, Paul’s experiences flying over worn-torn countries are thrilling and drew me into the story. Heidi–a war widow native to Germany but who has also lived in the United States–is the heart of Friends and Enemies. While her storyline did not interest me as much as Paul’s did, I found her sweet nature and the challenging circumstances she faced living in Germany but not believing in Nazism to be the most interesting part intellectually of Wangard’s book. At times Paul and Heidi’s romance didn’t feel believable, but its natural progression fit the story enough that I still enjoyed Friends and Enemies. With Wangard’s love of history and keen ability to implement historical details into prose, I predict this author will be one to watch in the World War Two genre. I am looking forward to reading the next two novels in this series, coming out in later 2016 from Hopesprings Books. Terri Wangard grew up in Green Bay, Wisconsin, during the Lombardi Glory Years. Her first Girl Scout badge was the Writer. 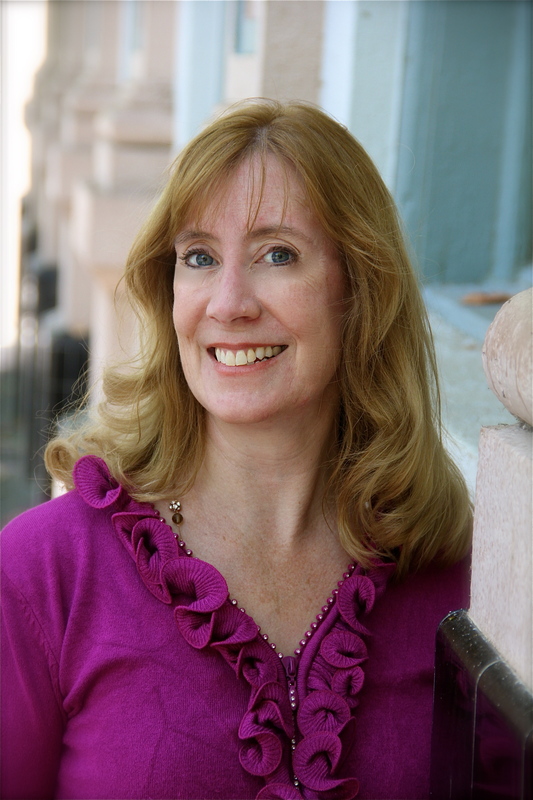 These days she writes historical fiction, and won the American Christian Fiction Writers (ACFW) Woodland’s Chapter 2013 Writers on the Storm (WOTS) contest and the ACFW 2013 First Impressions, as well as being an ACFW 2012 Genesis finalist. Holder of a bachelor’s degree in history and a master’s degree in library science, her research included going for a ride in a WWII B-17 Flying Fortress bomber. Classic Boating Magazine, a family business since 1984, keeps her busy as an associate editor. Fresh onto a new series set within her favored genre of World War Two historical romance, veteran author Sarah Sundin takes readers on a suspenseful and romantic ride in 1941 Boston. I have read each of Sundin’s novels, and I firmly believe at this point that she keeps writing stories better and better each time. 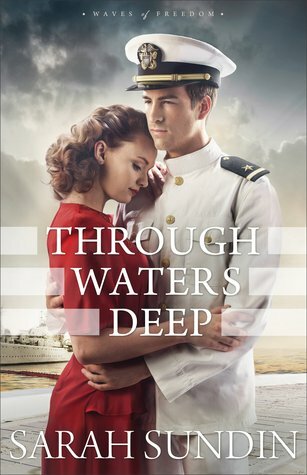 With Through Waters Deep she has taken her trademark historical romance and blended in a thoroughly developed mystery with suspense and deeper themes than in her previous novels. If this novel is indicative of her future works, readers are in for a fantastic lineup of Sundin’s books to come. I enjoy Sundin’s novels because she writes in my favorite time period—World War Two—with elements that make any story great: history, romance, faith, and friendship. Through Waters Deep contains all of these elements but stands out most highly because of the care Sundin took to research the time period and setting of the novel. I read blog posts on the author’s trips to Boston where she learned about the Navy Yard and various places around the city, but even without those posts I could glean from Through Waters Deep how much work Sundin took to bring the time period alive. From meticulous details about the ship the hero lived on, to the particularities of Boston in 1941, I could easily imagine every scene and setting in this novel. These details blend into the other aspect of Through Waters Deep that signifies Sundin’s latest release’s superiority over her other novels: the mystery and suspense of the Boston Navy Yard saboteur. Never in my life would I wander into a bookstore specifically looking for a mystery novel; however, I just may have to reconsider that statement in the future when it applies to historical Christian fiction. Sundin researched the particularities of writing mysteries before taking on Through Waters Deep, and both the prose and story demonstrate how much studying the craft of writing can assist a writer in penning an excellent book. Each page of Through Waters Deep brims with suspense, and the red herrings continually keep readers guessing at whom the real saboteur could be. In addition, Sundin betters her story by giving each potential villain a side story that turns him into a person with whom the reader could sympathize. I sat on the edge of my seat throughout this entire book—and I loved Through Waters Deep for that. Main characters Jim Avery and Mary Stirling became two of my favorite characters as I read Through Waters Deep. Jim is a dashing hero who charms his way into Mary’s and reader’s hearts; he carries just enough bravado to make him a man’s man, while simultaneously becoming a man of God’s own heart. Mary is a sweet and hardworking lady of faith, curious about the world around her and with a good and loyal heart. Between the two of them they prove that friendship always makes for a strong romance, and they grow in faith in love. Through Waters Deep could very well be Sundin’s strongest novel regarding faith. She makes the faith element of this story accessible, believable, and applicable for her readers. I loved Through Waters Deep and plan to re-read this novel because I’m sure there are elements of the story—especially the mystery—that I missed the first time around for reading it too fast. I just simply couldn’t put the novel down! The next book in the series, Anchor in the Storm, releases in 2016 and is already on my pre-order list. Sarah Sundin is the author of the upcoming Waves of Freedom series (Through Waters Deep releases August 2015), the Wings of the Nightingale series (With Every Letter, On Distant Shores, and In Perfect Time), and the Wings of Glory series (A Distant Melody, A Memory Between Us, and Blue Skies Tomorrow), all from Revell. In addition she has a novella in Where Treetops Glisten (WaterBrook, September 2014). Sarah lives in northern California with her husband and three children, works on-call as a hospital pharmacist, and teaches Sunday school and women’s Bible studies. Find Sarah online on the following sites: Facebook, Twitter, Pinterest , Goodreads, Amazon, and her website. A buried vow and a broken past meet face to face on enemy territory… Lieutenant Maggie Johnson has had to overcome many obstacles in her life, including her parents’ disapproval of her enlistment in the Army Nurse Corps and the sudden death of her GI boyfriend, Danny Russo. A sudden blow that forced her to leave behind a promise once made. But Germany introduces more hurdles that hinder her life. Like Army nurse lieutenant, Peggy Blizzard—a woman as cold as her name. While trying to avoid a war breaking out within her own barracks, Maggie pushes through Germany’s harsh winter, and Peggy’s cold shoulder, and aims to do her job—saving lives. But when tragedy strikes the field hospital, it’s Maggie’s life that needs saving instead. Maggie’s harrowing rescue will haunt her for months to come when a ruggedly handsome soldier comes to her aid and resembles the face of a man she once loved . . . a man who is dead. Is war playing mind games with Maggie, or is she facing the ghosts of her past? Find Maggie’s Mission on Amazon. Certain books and authors resonate deeply with readers so that when a new book is published by a certain author that reader does not even question the content of the novel. Maggie’s Mission was one such book for me because I whole-heartedly enjoy author Rachel Muller’s stories and company. Last summer Muller’s debut novel, Letters from Grace, was my favorite novel of 2014. By the time I finished this best-selling novel, Maggie’s Mission could not come soon enough for my avid reading tastes. While I found Letters from Grace to be the better of Muller’s two published novels, Maggie’s Mission is an enjoyable story that deftly draws readers into the European theater with rich historical detail, deep relationships between characters, and a background of faith that strongly exemplifies lessons readers can take into their own lives. Maggie’s Mission is primarily set within the European theater, with the rich details of that time and place shining brightly as one of the strongest aspects of Muller’s novel. As a combat nurse, Maggie’s experiences in Germany in the field hospitals are breathtaking to experience. Muller imagines the smells, sights, sounds, and emotions these nurses go through with sensitivity and thorough care for the veterans who bravely fought for our country. I am not one who searches out any sort of entertainment that showcases medical distress, but I truly did enjoy Muller’s hospital scenes in spite of the horrific trauma that went on in those field hospitals. She describes with detail the tasks Army doctors and nurses performed in the theater without overt graphics. I appreciated reading these scenes because it gave me a chance to fully comprehend the stress, pain, and complications of wartime medicine. Friendship and romance are at the core of Maggie’s Mission, and the relationships that comprise this novel form the backbone of Muller’s story. Throughout the story Maggie’s triumphs and struggles with her fellow Army nurses provide life lessons of friendships that readers can emulate and learn from in real ways. 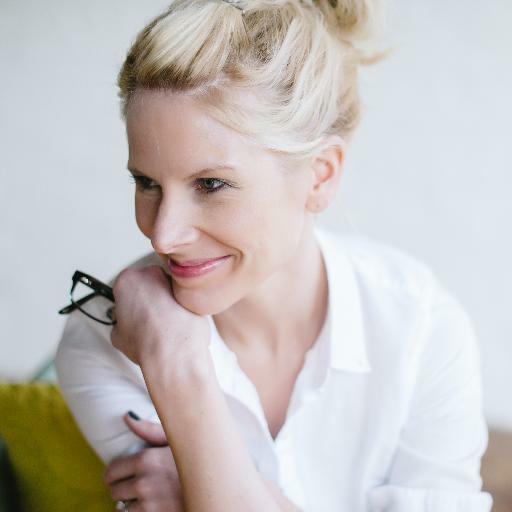 Muller has a knack for filling her novels with relationships that are thought-provoking and deep. In Maggie’s Mission we see the main character remain firmly rooted in her friendship with Grace, from Muller’s first novel, and cross boundaries with Peggy Blizzard, a surprisingly refreshing character who teaches Maggie about loving like Jesus. My favorite part of reading Maggie’s Mission was watching Maggie’s friendships deepen and unfold in the European theater. The drama and danger these women experienced while depending upon each other is rather remarkable to imagine. Romance in Maggie’s Mission centers around the lost loves so many men and women experienced because of the horrors of war. Maggie grieves the loss of her boyfriend, Daniel Russo, through much of the novel while simultaneously attempting to move on with life with another man. I did not feel much of a connection to either man as a romantic lead, but nevertheless reading Maggie, Danny, and Walter’s romance brought me back to a time when life and love were tumultuous at best. 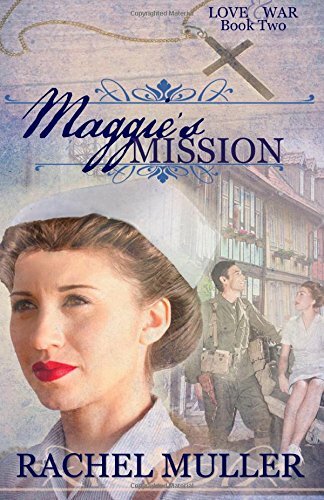 Maggie’s Mission is an addition to Muller’s Love and War series that I recommend for anyone who enjoys World War Two fiction. This is Christian fiction that will move readers deeply with its emphasis on the strengths of relationships and faith. I am definitely looking forward to Muller’s third novel in the series, Philip’s War, as this story will focus on the challenges of soldiers returning home from war. Muller’s love for War World Two history and the people who experienced all that went on during that time is evident in the tone she sets with her writing. I am certain that the pain, heartaches, and ultimately love that brought veterans and their wives and families through this time will drive Philip’s War in a beautiful way. Obsessed with World War II since the tender age of 17, Rachel has been studying The Greatest Generation for 13 years and composing stories of love and war for three years. Her first project, Letters from Grace, claimed a spot in Harlequin’s So You Think You Can Write Contest in 2012 and semi-finaled in ACFW’s Genesis Contest, 2014. Letters from Grace, book 1 in the Love & War series, released September, 2014. She resides in Central Maryland with her husband and four children. Readers can learn more about Rachel at her website or find her on Facebook, Twitter, Amazon, and Goodreads.